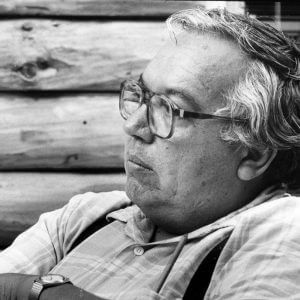 John Mohawk (1945–2006) was a scholar of American history, writer, teacher, international negotiator, cultural revivalist, and social activist. He was associate professor of American Studies at the State University of New York (SUNY), Buffalo, and director of Indigenous Studies at its Center of the Americas. Founder of the Iroquois White Corn Project to protect small-scale indigenous farmers, he was also co-founder of the Indigenous Peoples Network, the Emergency Response International Network, the Seventh Generation Fund, and the Indian Law Resource Center. He was the editor of and contributed to Akwesasne Notes, known as “the Voice of Indigenous Peoples,” founding editor of Daybreak, a national magazine about Native Americans and indigenous peoples, as well as a columnist for Indian Country Today. Mohawk was a member of the Turtle Clan of the Seneca Nation, Seneca Elder historian, and the visionary spokesman for the Haudenosaune (Iroquois) Confederacy of Nations. A specialist in the fields of culture and community economic development, he was an advocate for the rights of indigenous people. Although a staunch member of the traditional Indian movement, he was nevertheless able to act as a bridge to the world of Western academe and journalism. Mohawk was also a skilled crisis negotiator in local, national, and international conflicts. He was the primary author of A Basic Call to Consciousness (1978), the collective work of the Haudenosaune Grand Council on the value of traditionalism as a guide to political activism. His books include The Red Buffalo (1971); Exiled in the Land of the Free, co-edited with Oren Lyons (1992), Utopian Legacies: A History of Conquest and Oppression in the Western World (2000); The Iroquois Creation Story: John Arthur Gibson and J.N.B Hewitt’s Myth of the Earth Grasper (2005); and Thinking in Indian, a collection of posthumously published essays. John Mohawk received a B.A. in history from Hartwick College as well as a master’s degree and Ph.D. in American Studies, both from the University of Buffalo.